This book does not profess to have all of the answers. Early adopters of PPM, an emerging art and science, are reporting phenomenal results. Nevertheless, as proven in the Hawthorne experiments, almost any kind of change can bring about initial improvements. Do we need more time to be sure that the improvements that have been experienced are directly related to the adoption of PPM practices? I think not. The first decade of PPM development and application has produced numerous stories of enormous success. We present four of these success stories in the case studies in Section Nine. If there is any doubt about the value of PPM, it is whether PPM is equally effective across all project environments. In Chapter 3.2 on project prequalification, we look at three typical classifications of projects and discuss the applicability of PPM to each of these. We have no doubt that there is a vastly increased awareness of the forces that help projects to contribute to business success. Through PPM, noticeable improvements in communication and cooperation between the various disciplines of the enterprise are being achieved. Nevertheless, there are those who believe that some of the processes offer a simple formula for a complex condition. Some of these processes deal with financial valuations of the proposed projects, such as benefits, return on investment, or net present value without directing much effort toward how these values can be determined. Many PPM tools offer extended abilities to display such values without support for creating valid data. Other tools, such as analytic hierarchy process (AHP), are specifically designed to assist in simplifying the prioritization of complex issues and data. AHP is widely recognized and employed as an aid to the decision-making process (see Chapter 4.3). Still, the skeptic in me pauses to ask whether even this admirable technique might focus too much on the details and miss the big picture. And then there is the other extreme: where supposedly very precise data are displayed with attractive, advanced graphic techniques. These techniques, such as the increasingly popular bubble chart, are superb vehicles for presenting extensive, multidimensional data in intelligent, usable formats. They are so impressive as to allow us to overlook the possibility that the data displayed may not sit on a solid foundation. I find my skepticism to be directly proportional to the PPM software hype curve. The root of my skepticism lies in the benefit and benefit-risk side of PPM. I see bubble charts and Web forms as too simple and shallow to support the depth needed to analyze significant undertakings. Significant undertakings require in-depth business plans with market positioning, detailed financial models, trade-off studies, and competitive analysis. This analysis takes place well before any projects are initiated and continues throughout the life cycle. The approval process is interactive and face-to-face with many PowerPoint briefings. Now, one could argue that the PPM discipline embraces all this, but this embracing is more a declaration of hoped-for ownership rather than value-added. Because PPM software is limited to simple projects, it is relatively well positioned for internal work like information technology projects. I don't think I will ever see the day when Ford executives look at a project portfolio bubble chart to pick which cars to build. I do think that an IT exec could decide on a Web-based expense report over an upgrade to Office 2999 or vice versa using the PPM tools (but maybe not even here). One message that we can derive from my colleague's declaration is that (as in any other discipline) we need to understand the available processes and tools and be prepared to apply them where practicable—but not blindly. Every data-based process is subject to somebody fouling up the numbers. Diligence and dutiful wariness must be built into the process. Nothing in the PPM process precludes preparing traditional business plans and analyses. In fact, they are strongly endorsed. Where PPM helps is in dealing with multiple business plans and opportunities. Remember also that portfolio planning is based extensively on forecasting. I once read that forecasting is like driving an automobile while blindfolded and taking directions from someone who is looking out of the back window. You certainly want to be careful in betting the future of the company on data such as these. To avoid falling into the trap of accepting faulty assumptions and data, everyone involved in PPM should become a devil's advocate. By this, I mean that we need to question things that look too good. Someone has to ask the difficult and probing questions. We need to be careful not to get swept up in the current of popular opinion. It may not take you where you want to go. Even having said this, I am confident of the value of PPM as the best means of addressing the issues of aligning projects with strategies and attempting to select the best projects for the health of the business. This book presents the many sides of PPM. The other authors and I offer an extensive overview of the fundamentals and why and where they can be employed. We provide several discussions of specific issues and techniques. Throughout the process, we maintain a skeptic's eye so as not to overly promote any part of this emerging discipline. We have noted that PPM is already delivering positive benefits and results. This book does not offer the final word on PPM because it is a work in progress. Still, it is fully ready for prime time, and we sincerely recommend that you consider putting these practices into action. We will also be maintaining a watchful eye on these applications, ever ready to report and implement improvements based on such feedback. What Is The First Essential Step To Be Taken Before Starting Your Own Business? 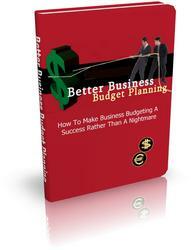 Enter Effective Business Budget Planning Learn All The Crucial Steps Necessary To Plan Your Budget For A Successful Business Career Today! Being The Next Big Entrepreneur Of The Century Has Never Been So Possible, download To Discover All The Secrets!